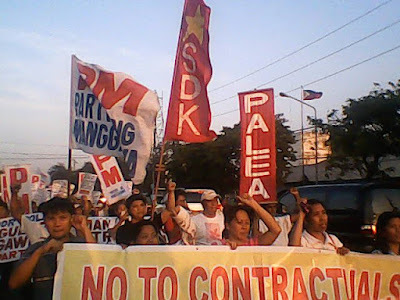 With its provisions that can be considered as marked improvement from existing laws and regulations pertaining to labor contracting, particularly Article 106 of the labor code and DO 174, rules and regulations on labor contracting promulgated by the DOLE last March 2017, Nagkaisa!, the largest labor coalition of worker’s union and labor organization in the country supports HB 6908, an act strengthening workers security of tenure, which was approved on second reading by the house of representatives last January 23. (d) Labor contractors found violating labor-only contracting provisions of this act shall be fined Php 30,000 for each worker engaged in labor-only contracting arrangement but the total amount of the fine shall not exceed Php 5 million. Nagkaisa! admits that HB 6908 is not a perfect bill to prohibit all forms of labor contracting. However, the marked improvement in its provisions would surely address to a great deal widespread use of contractual labor in the country, and thus strengthening workers’ security of tenure and the exercise of their right to organize and collectively bargain compared to the present laws and regulations pertaining to labor contracting. Nagkaisa now calls on the Senate to introduce more prohibitive provisions in their version of bills pertaining to security of tenure so as to further improve what HB 6908 has achieved. Finally, we thank the efforts made by Cong. Ting, Chairperson of the Labor Committee, representatives of TUCP and Akbayan! partylists, and the rest of the co-authors of HB 6908 for successfully defending and passing it on second reading.